A herniated or ruptured disk (sometimes called a “slipped” disk) is a disk that has had its outer ring of annulus ligaments rupture, allowing the nucleus to “leak out” irritating nerves and causing pain. This is similar to an abdominal hernia – where the muscle of the abdominal wall has torn or ruptured, allowing some of the intestine to poke through. A related condition is Cervical Disk Disease or cervical disk herniation. What’s the difference between a bulging diskand a herniated or ruptured disk? 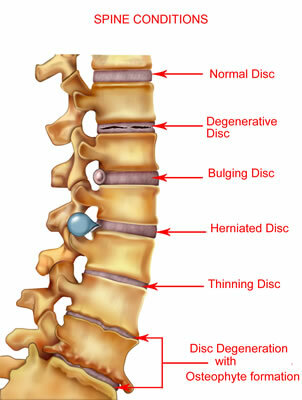 Symptoms of a herniated disk are the same as for a bugling disk. Where the herniated disk presses on nerve roots, it can cause pain, numbness and weakness in the area of the body where the nerve travels. A herniated disk in the lower back can cause pain and numbness in the buttock and down the leg – called sciatica. Sciatica is the most common symptom of a herniated disc in the low back. A herniated disk in the neck (cervical spine) can cause pain and numbness down the arm and into the hand. Leg and arm pain caused by a herniated disk is also referred to as radiculopathy. A herniated disk can also be treated with non-steroidal, anti-inflammatory medication if the pain is only mild to moderate. An epidural steroid injection may be performed using a spinal needle under x-ray guidance to direct the medication to the exact vertebral level of the herniation. The medication will help relief pain and swelling. Ask your doctor about medicine to treat your symptoms. Medicine won’t cure a herniated disk, but it may help with pain and swelling. Your doctor may also recommend physical therapy. The therapist will perform an in-depth evaluation; which combined with the doctor’s diagnosis, will dictate a treatment specifically designed for patients with herniated disks. If you suffer with a herniated disk and your current treatment plan leaves you feeling hopeless, perhaps a fresh set of experienced eyes can change your outlook. Since 1990, Dennis M. Lox, M.D has applied his personal interests in sports medicine, cutting-edge regenerative medicine and chronic pain management to helping patients increase their quality of life. Contact us for an appointment at 727-462-5582.